A year ago, I posted a picture of a grave marker at the Downey Cemetery (The man behind the marker, Nov. 11, 2013). In that post, I speculated about Tony Gomez, the man buried there, and I used Google to fill in some possible information. Imagine my surprise when Tony Gomez's grandson and his wife, Tony and Alma, contacted me earlier this week with more information. 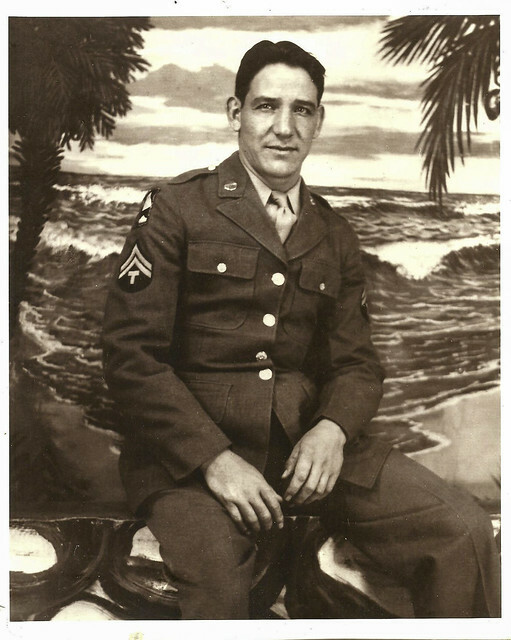 So, today's post contains a picture provided by Alma Gomez, along with more information about this man who served our country and made the greatest sacrifice. "When my husband Anthony talks about his grandpa Tony, he talks about him being a war hero. We at the time only had one picture of him, and that was of him in his Army uniform. So wanting to know more information about this amazing man, I started my research. "I found out that Tony Gomez was born on March 10, 1918, to Juan and Sarafina. He married Benita in 1940. They lived together in Denver, Colorado, and had two children, Gloria and Tony. He enlisted in the Army on July 26, 1943. When he left, he left behind a pregnant wife and a baby daughter. "Tony Gomez was assigned to the 306 Infantry 77 Division. Although unclear, the story that has been told to us by family members is: Tony fell on top of a grenade to save his platoon. He was given the congressional Medal of Honor and the Purple Heart. I'm in the process of authenticating the story that has been told us. I'm just waiting to hear from the National Personnel Records Center, this is where they hold military personnel records. " "While Tony Gomez was fighting, Benita wrote him a dear John letter. So when he died, they did notify Benita of his death but she did not claim his body. Therefore his brother and sister who lived in Paramount, California, claimed his body, and that is why he was laid to rest in California. Tony Gomez was a father of two and would have had seven grandchildren in total. Gloria had five children, Valerie, Louie, Abraham, Debra, and Gary. Tony had two children, Anthony and Adina." Thank you, Tony and Alma, for sharing this story with us. And our thanks go out today to all the veterans who have served our country.